The DVForge philosophy is to create tiny, convenient products that interconnect one instrument, one microphone, one channel of sound. DVForge has mulitple patents pending on a variety on inline, single-channel, plug-in devices that connect an instrument, a microphone, or another music device to either an analog or digital cable. To build a miniature practice aid that plugs into the output jack of an electric guitar or bass, and that transmits a radio signal that lets any nearby FM stereo receiver become an on-demand amplifier. Make it so that the signal is strong and clean, and so that a musician can take advantage of any stereo system, at home or in a vehicle, for use as an practice amp. The same tiny size as DVFrge original JamPlug miniature guitar amplifier, the JamPlug FM replaces the built-in amp function of the earlier product with a strong, clean FM radio transmitter. It lets you use any FM radio receiver as an on-demand guitar amplifier. In your car or truck, , with any home stereo system, the JamPlug FM reliably transmits the signal from your electric guitar of bass, so that the stereo system picks it up and plays it. The JamPlug is injection molded from durable bright-white ABS plastic, and is designed to last a lifetime. It has a 1/4" instrument plug (for your guitar or bass), a pushbutton selector switch for tuning to any of six built-in frequencies, an on-off button switch, and a thumbwheel-style volume control. It operates for hours on its built-in rechargeable battery, and it includes its own small AC wall charger. The JamPlug FM works with all electric guitars and electric bass guitars. Basic operation is simple. Just plug the JamPlug FM into your guitar or bass, set the levels, select an open FM channel, tune your radio to the same channel, and start playing. The JamPlug sets up much like an analog tube amp. There's even the least little bit of "tube hiss" in the sound, as well as available overdrive distortion. To get the sound you want, just experiment with setting the output levels from your guitar or bass, and the gain level on the JamPlug, just like with a normal guitar amp. To build small USB audio adapters for Mac OS X users that plug right into the output jack of an electric guitar, bass, or dynamic mic and that convert the analog signal output to a high quality USB audio signal, for sending to a computer USB audio input. With more Mac owners using recording software, like Apple's GarageBand or Logic, to build music tracks at home, DVForge realized that an entirely new approach was called for to connect instruments and microphones to the computer, something much smaller and simpler than anything else that's available. DVForge patent-pending approach to creating small, but high quality digital interface products has resulted in the GuitarPlug and the MicPlug, for connecting an electric guitar or dynamic microphone, respectively, to any Mac system with OS X using a simple USB cable. The GuitarPlug is the device for connecting your electric guitar or bass to an OS X Mac, for home recording, or even for live play-through. It works with single or double coil pickups, with active pickups, and with any audio software that accepts a 16-bit, 48KHz USB audio signal. This product is good enough for any professional use in either live performance or recording. The MicPlug is built for connecting your dynamic microphone to an OS X Mac, for home recording, or for live play-through. It has an XLR connector, and works with any OS X audio software that accepts a 16-bit, 48KHz USB audio signal. The clarity and cleanliness of the the analog to digital conversion, and the low-latency are good enough for professional recording usage. 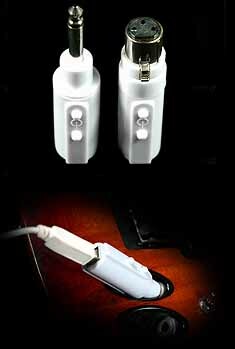 Both GuitarPlug and MicPlug are cylindrical, 2.3" by .7" in size, are USB bus powered, have an on-off switch, and have a blue LED power indicator. They convert mono analog audio to 16-bit, 48KHz better than CD-quality digital USB audio, and are class compliant, plug and play devices. They work with any Mac music software that specifically accepts a 48KHz/16-bit USB digital audio input. They are specifically built to work with Apple's music software, including Logic, Logic Express, and GarageBand. The GuitarPlug has a 1/4-inch guitar plug for use with any analog electric guitar or bass, and the MicPlug has an XLR plug for use with any dynamic stage microphone. Both have a sturdy on-off pushbutton switch, and are powered directly from the attached USB cable, with no battery needed. Both are ruggedly made devices intended for serious use by serious musicians. Latency Note: Latency in DVFore hardware is inaudible (under 3ms). Total latency on your system will depend upon the USB system in the specific Apple computer and software you are using. In OS X 10.2.8 or higher, using GarageBand, Logic, or Logic Express, the total latency is still inaudible (under 10ms). Your actual total latency will depend on your overall setup.